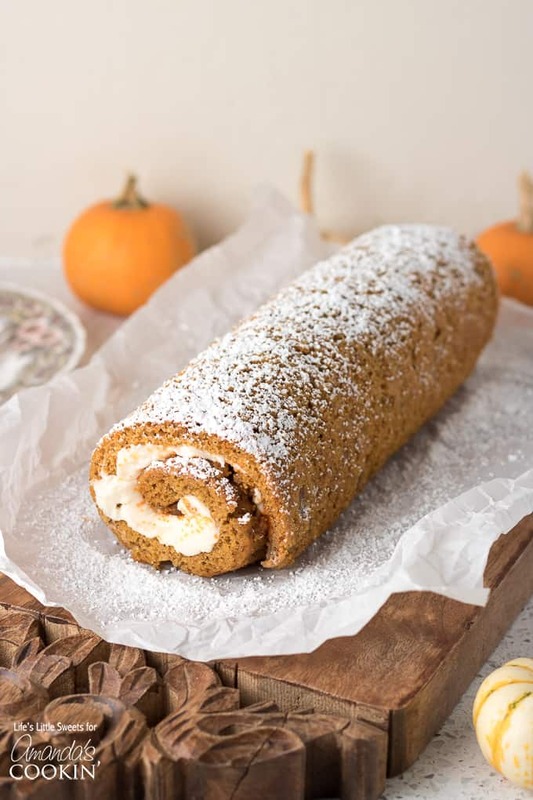 Pumpkin Roll: a new Thanksgiving dessert favorite! 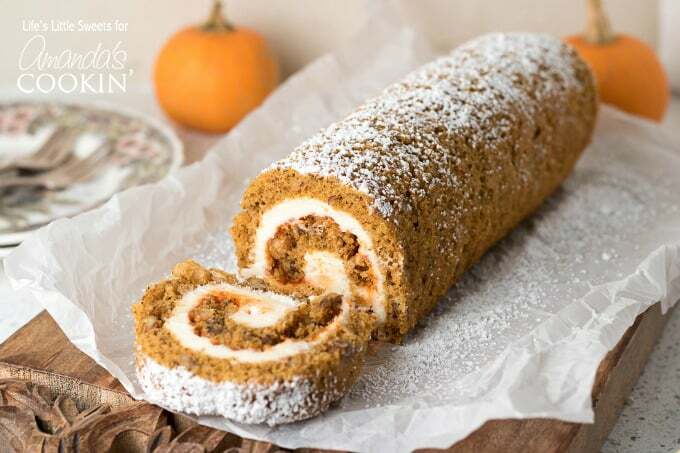 This Pumpkin Roll recipe is the perfect recipe to feature on the Thanksgiving dessert table! This Pumpkin Roll is a thin, moist pumpkin cake with or without walnuts, filled with a creamy frosting mixture and wrapped into a swirl of sweet heaven! Hey Everyone, how’s your November going? Is it flying by as fast as mine? It seems like we were just at Halloween. Can you believe how close we are the Thanksgiving? Are you looking for a dessert that is a little more special than the usual pumpkin or pecan pie? Let me be clear – there’s nothing wrong with those two dessert choices, by the way, those are some of my favorites but why not try something a little different but just as beloved? 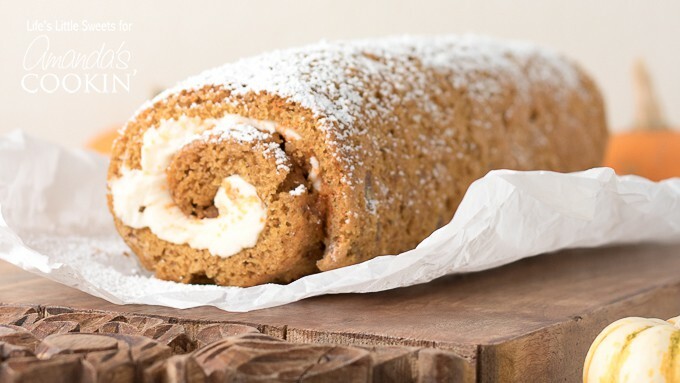 Let’s hear it for this Pumpkin Roll! 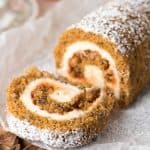 This Pumpkin Roll recipe is also a great way to use up an unfinished can of pumpkin puree because it requires only 2/3 cup. Yes, only 2/3 cup and you get that gorgeous golden pumpkin color. 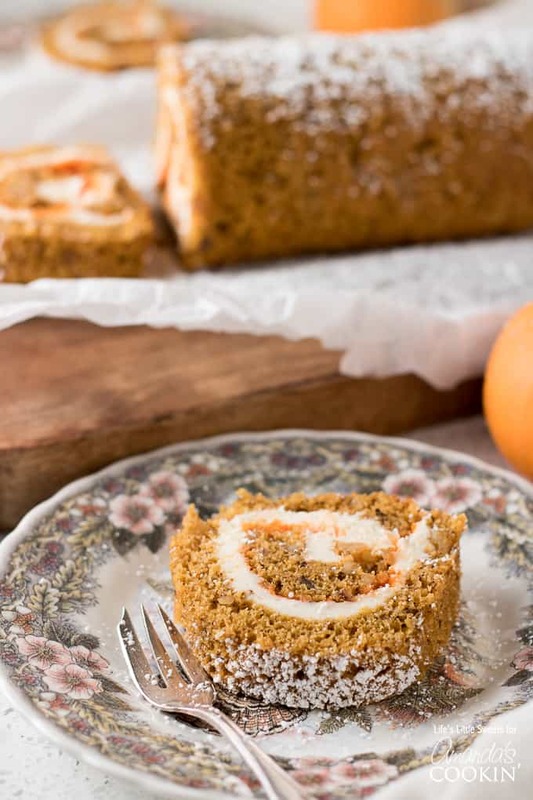 I will have you know that I do enjoy a slice of this Pumpkin Roll with my morning coffee…why dessert for breakfast? Because life is too short and fleeting not to and it goes so well with a hot cup of coffee or tea for that matter. I advise you do the same – at least once in a while! 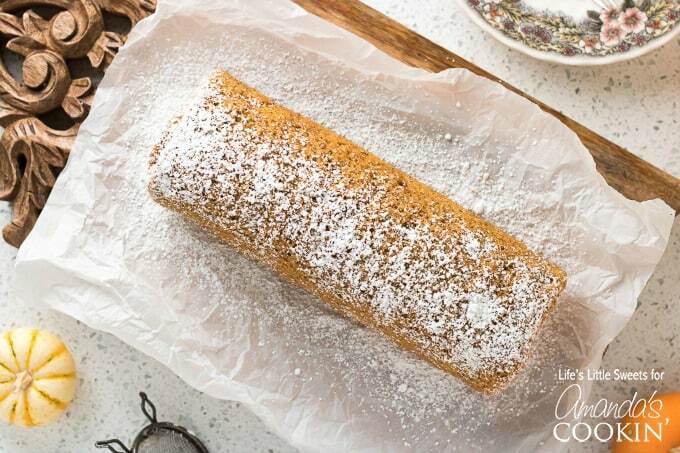 This recipe is inspired by Libby’s Pumpkin Roll. Be careful when you are rolling and re-rolling the cake being careful not to crack the cake. You want to make sure that your cake isn’t too wet or too dry. Spread the filling evenly so you get a nice, round swirl when you slice through and you will be all set! 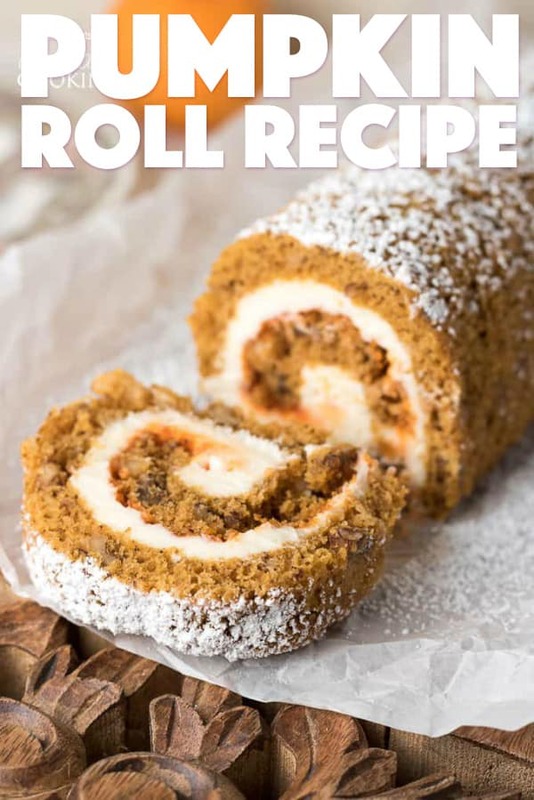 I know you will love this Pumpkin Roll recipe! 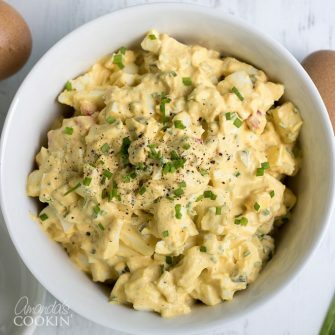 For more delicious Thanksgiving recipes check out the list below! Preheat oven to 375 degrees F. Grease a 15 x 10 inch jelly roll pan. Line with parchment paper going over the edges. Lightly flour the parchment paper. Lightly sprinkle confectioner's sugar evenly over a thin kitchen tea towel (at least 15 x 10 inches as well). In a medium mixing bowl, combine flour, baking powder, baking soda, cinnamon, cloves and Kosher salt. In a large mixing bowl, beat eggs, granulated white sugar until thick and combined. Add pumpkin puree. Stir in flour mixture until combined. Fold in nuts. Alternately, you can spread the batter into the jelly roll pan and then sprinkle the nuts on top, or omit nuts if you wish. Bake the cake for 13-15 minutes. Please note, dark pans cook faster, check at 11 minutes. The cake should spring back when touched when checking for doneness and you want to make sure it's not wet. When it's done, turn over onto the tea towel and remove the parchment paper. Starting at the short end, carefully roll the cake up in the towel and let cool on a wire rack. In a large mixing bowl, beat cheese, powdered sugar, butter and vanilla until smooth. When the cake is cool, carefully and slowly unroll and spread with an offset spatula until even. Add orange sugar sprinkles, if desired. Roll the cake together, wrap in plastic wrap and refrigerate for at least 1 hour to set before slicing. For storing cake, wrap in plastic wrap and store in the refrigerator. Sprinkle with confectioner's sugar before serving. You will need a 15 x 10 inch jelly roll pan for this recipe. Calorie count does not include optional chopped walnuts or pecans, or the orange sugar sprinkles.